A Concert Suite for Two Pianos/Four Hands. Composed by Georges Bizet (1838-1875). 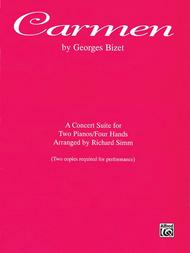 Arranged by Richard Simm. This edition: 2 copies required. Duet or Duo; Piano Duo (2 Pianos, 4 Hands); Solo Small Ensembles. Advanced level piece for the Piano Duo event with the National Federation of Music Clubs (NFMC) Festivals Bulletin 2008-2009-2010. Latin; Masterwork Arrangement; Romantic. Sheet. 64 pages. Belwin Music #00-PA9603. Published by Belwin Music (AP.PA9603). 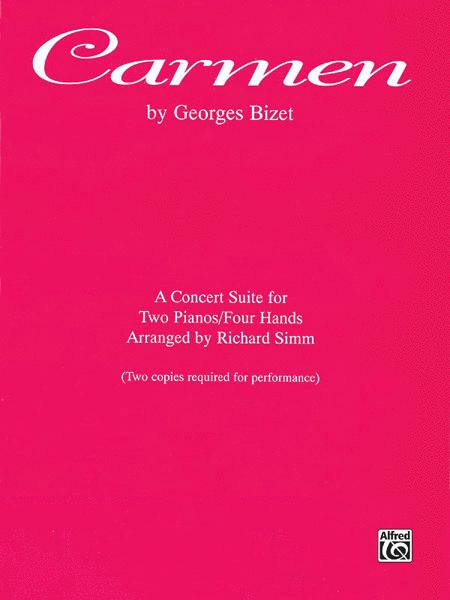 Carmen is a multi-movement work, and this arrangement provides all the lustre from the original orchestral score equally shared by the two pianists, creating a most exciting performance piece. Movements may be performed separately, thus making it a bit more simple to learn, or it may be performed in its entirety. Sure to be a big hit with two-piano teams. A Federation Festivals 2016-2020 selection. This is a very nice 2-piano arrangement for advanced pianists. Well done and it still sounds like Bizet! Good arrangement.
. That didn't stop us from performing it ... but it's not really a great arrangement. It's cute, though, and some of the movements are very easy to play. Ensemble-wise, some of the faster movements are a bit tricky, but do-able. Wonderful arrangements of old, familiar music. Simm gives nearly equal degree of difficulty to the two pianos. This arrangement is very fun to play. A good start for an advanced student wanting to bring two piano pieces into his/her repertoire.